First, have a Bloody Mary. Prepare for the Hollandaise Sauce by placing the 4 egg yolks, lemon juice, salt and pepper in a bowl. Place that bowl in a larger bowl of lukewarm water. (This gets the chill off the eggs) Put the 2 sticks of butter in a measuring cup. Have another Bloody Mary. Fill a large skillet halfway with water, the vinegar and the salt. Bring to almost a boil. In another skillet lightly grill the Canadian Bacon. Keep warm, but do not dry out. Butter the English Muffins and get ready to toast. Have one more Blooddy Marrry. Empty the egg yolk mixture into a blender. Everything should be ready to go at this point: Muffins toasting, bacon grilled, water simmering. Melt butter in microwave until hot, about a minute. Run blender on high and slowly add the melted butter. Sauce will thicken. Gently crack and drop each egg into the water in the skillet. Poach for about 2 minutes (you want the yolks to be runny). 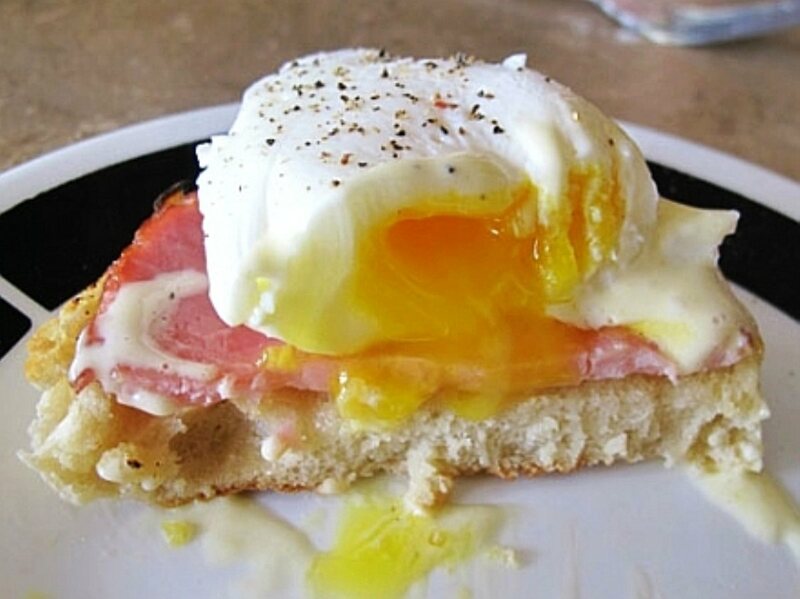 To assemble start with the English muffin, then the Canadian bacon, then the poached egg, removed with a slotted spoon. Cover with Hollandaise Sauce. Serve with cheese grits, a grilled tomato, assorted fruit chunks, and………one more Bloody Mary. Taco Ring – Easy and amazing!